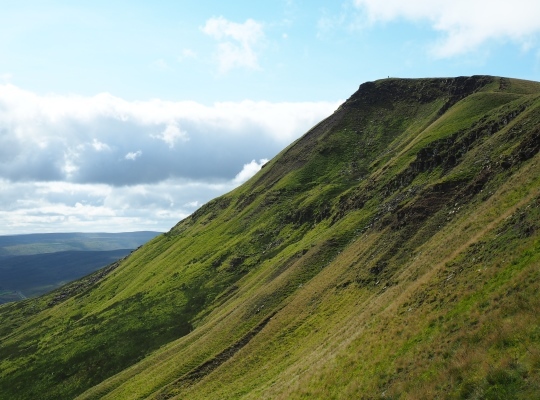 Situated just outside the original boundary of the Yorkshire Dales National Park, Wild Boar Fell is one of the finest hills in the Pennines. 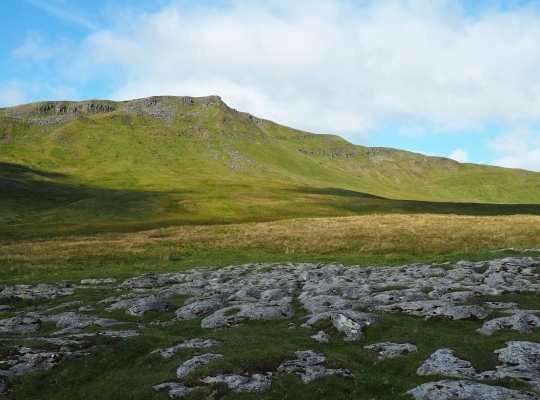 Wild Boar Fell is the legendary home of the last wild boar to survive in England and which was supposedly killed by Sir Richard Musgrave of Hartley Castle in the 15th century. Sir Richard’s tomb in Kirkby Stephen was opened in the 19th century and in it two tusks were found with his remains so perhaps there is some truth to the legend. 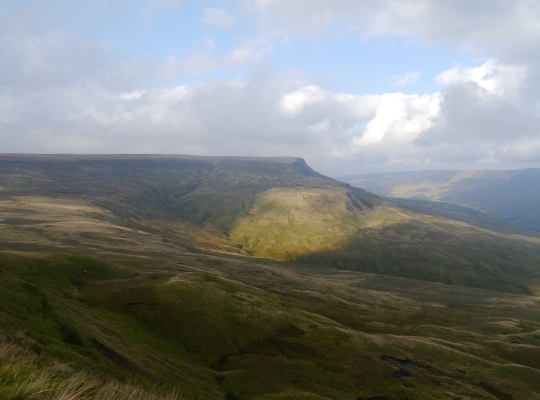 It is the eastern slopes above Mallerstang that give Wild Boar Fell its distinctive and easily identifiable profile. Here a series of scars create a magnificent escarpment with the dramatic Nab at its northern end. 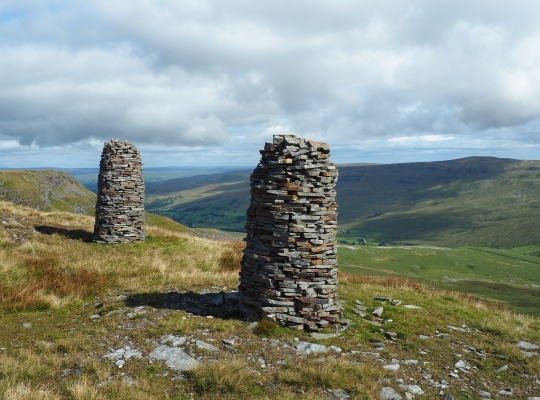 Added interest on the escarpment is the set of cairns, or standards, on the edge of High White Scar, Wild Boar Fell’s answer to the Nine Standards of Nine Standards Rigg. 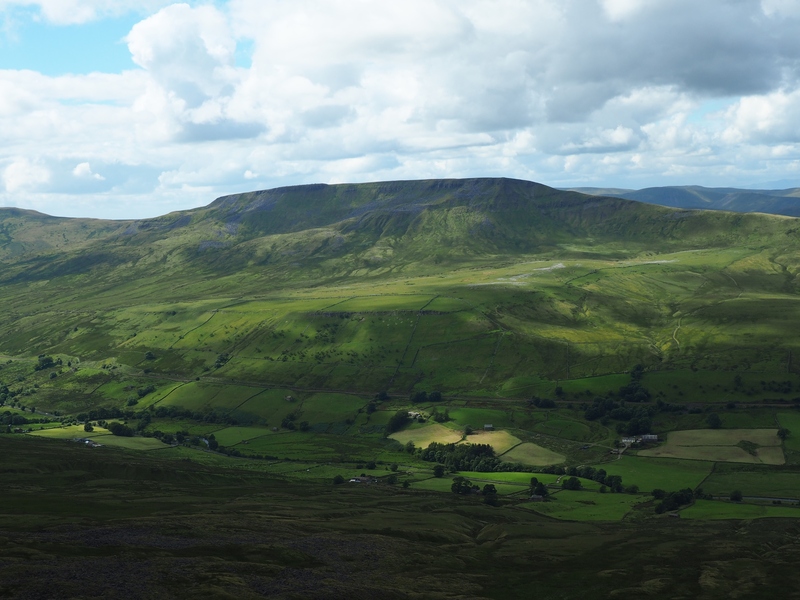 The views of the Mallerstang valley from the escarpment, and particularly from the Nab are simply stunning. To the west of the escarpment is a broad, fairly flat and soggy summit plateau. 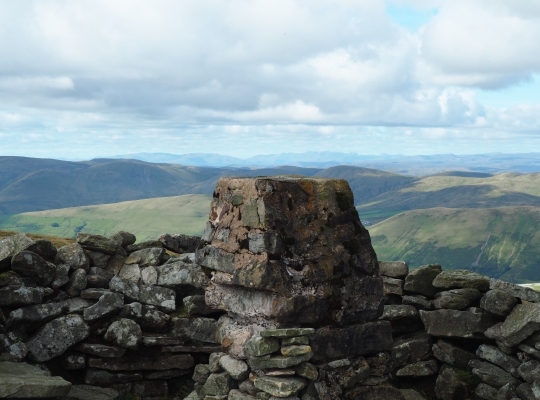 The generally accepted summit of the fell is a stone built Ordnance Survey trig point surrounded by a stone shelter on the western side of the plateau. The Database of British Hills claims that a stone thirty metres south of the trig point is 3cm higher than the base of the trig point. I’m a keen hill bagger but that is a margin so fine that I’ve never felt the need to accept the trig point as anything other than the summit. Regardless of whether it is exactly the highest point the view from the trig point, especially looking west, is really quite stunning. To the south-west is a fine view of the ever shapely Howgill Fells and to the north-west an expansive view across the old county of Westmorland. If blessed with good visibility the view further west reveals a superb outline of Lakeland mountains. A few hundred metres to the west of the summit and below the western lip of the plateau is Sand Tarn. 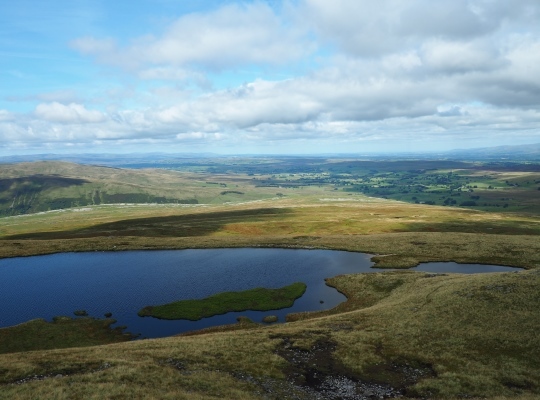 For lovers of remote moorland tarns it is a real gem. Apparently in days gone by locals from nearby Sedbergh would gather sand from the tarn’s small beach to use for sharpening knives and other implements. A mile further west of the tarn, across some fairly featureless moorland, there is a sudden and spectacular transition to limestone country in the shape of the limestone pavements and scars of Fell End Clouds and Stennerskeugh Clouds. This transition from gritstone to limestone is mirrored on Angerholme Wold below the eastern escarpment. Here can be found several limestone pavements, numerous pot holes and several erratics. To the south of Angerholme Wold there is also some impressive limestone scenery that can be viewed with care in the ravine of Ais Gill. Ironically on my first visit to Wild Boar Fell I wasn’t supposed to be climbing the fell at all. 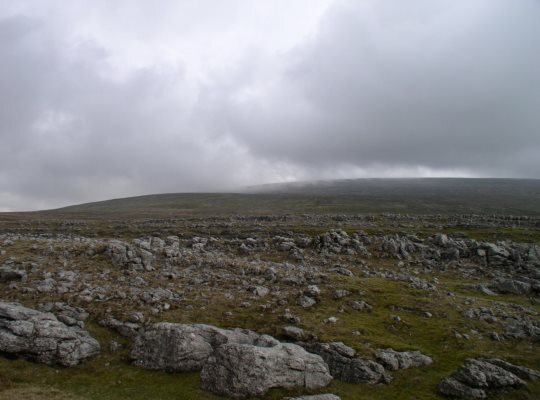 In one of my earliest walks in the Dales my friend Matt and I had actually set off to just climb neighbouring Swarth Fell. Almost inconceivable now to do one without the other, the reason for just attempting Swarth Fell on its own was because we were following a route in Brian Smailes’s book ‘The Yorkshire Dales Top Ten’. Climbing up alongside Ais Gill it was hard to maintain our focus on Swarth Fell with Wild Boar Fell looming so impressively above us to the north. Before we’d even reached the tarn in the saddle between the two fells we’d decided to detour up on to Wild Boar Fell first. 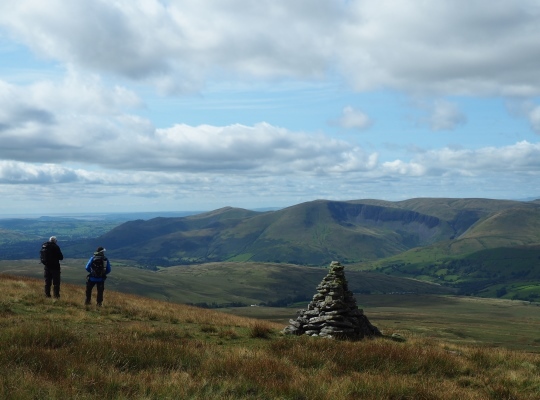 The weather was glorious and in a year when nearly every summit we visited was in hill fog the views we had from Wild Boar Fell were appreciated all the more. For this reason Wild Boar Fell will always have a special place in my heart.